St. 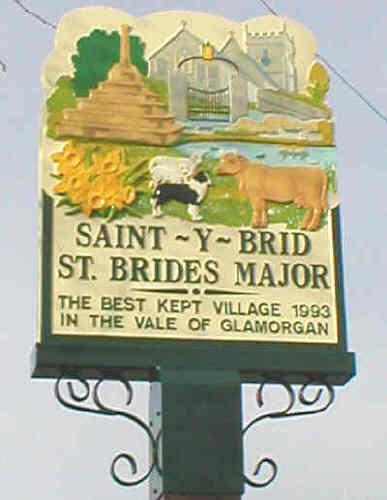 Brides Major is a friendly and attractive, small village in the beautiful Vale of Glamorgan in South Wales. 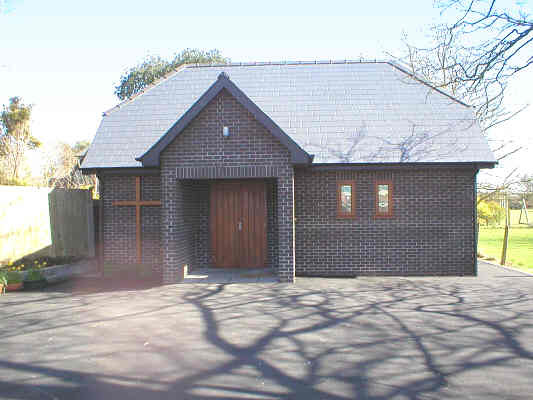 Lying approximately three miles south of Bridgend on the B4265 between the villages of Ewenny and Wick, it boasts a number of amenities for the benefit of villagers and visitors alike. From the roundabout on the A48 take the B4265 to travel through Ewenny and pass the turn-off for Ogmore-by-Sea*; go straight through a set of traffic lights with a quarry on the left, over a cattle grid then pass a quarry on the right. The road bends and twists and you will pass Pant Quarry on the right then see many trees both sides of the road that have been planted to commemorate various events since around 1815 onwards. * The B4524 travels from Ewenny through Ogmore Village, Ogmore-by-Sea and Southerndown into St. Brides Major. As you approach the village there is a slope on the left hand side that is very popular for tobogganing after heavy snow! 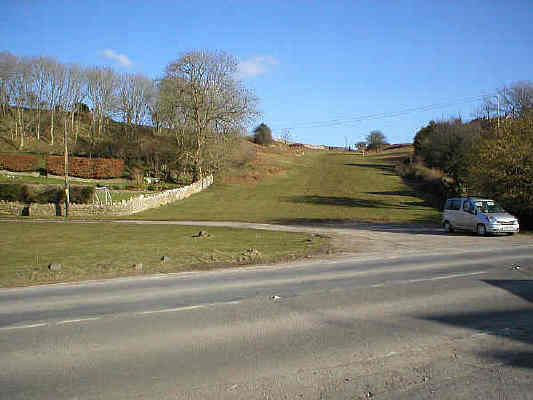 Cross the cattle grid and follow the road around, then as it narrows the The Fox and Hounds that serves local beers and home-made food is on the left on a sharp bend** and the Village Shop that sells a wide variety of goods and provisions, as well as housing the Post Office, is on the right. ** If you turn right here, the entrance to the car park is on the left and the road leads to the Parish Church of St. Bridget's nearby (it has a very steep slope) as well as to the village school which caters for children up to the age of eleven. As you travel on through the village you will pass a footpath entrance to the school and care should be taken in the morning and afternoon because many children will be trying to cross the road as well as others alighting/boarding the bus and particular parking restrictions apply. There is also a building nearby with a hairdressing salon. At the junction of Southerndown Road, Ewenny Road and Wick Road is a small green where a Village Sign depicting the area also records the award of Best Kept Village in 1993. 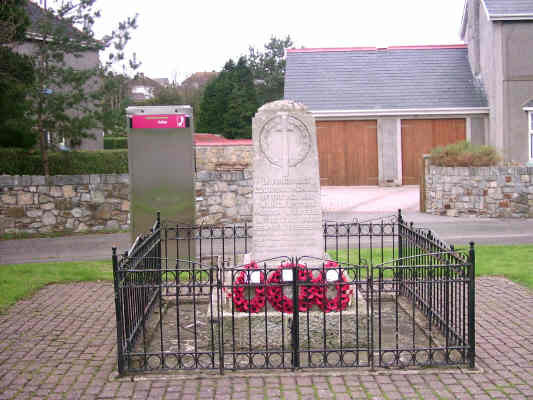 The War Memorial is also here; the base is made from Sutton stone and the names of the fallen are on Portland stone. There are also two seats where you can pass a quiet hour and watch the world go by. Across the road are the premises of the local Funeral Directors. If you turn right here onto Southerndown Road you will pass the Church Hall on your left (used as a Polling Station at election time) then if you follow the road to the left you will travel to Southerndown; if you take the right fork and go straight up the hill you will come to the football field with sports pavilion and carrying on you will enter Heol-y-Mynydd. 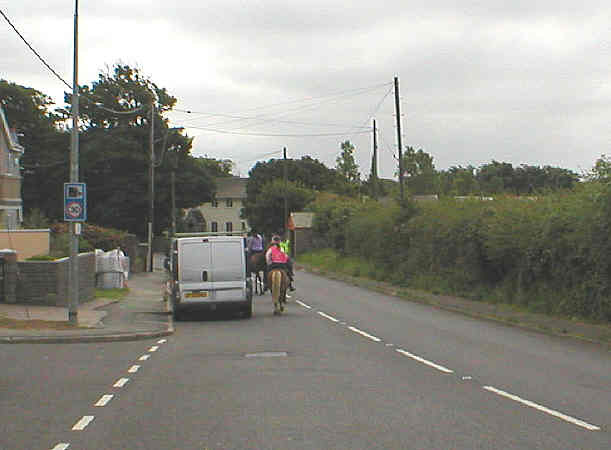 Very often there are horse riders on their way to the common and who have to cross the main road to follow some bridleways. If you do not turn off at the village green but carry on through the village in the direction of Wick and Llantwit Major, you will pass Pool Farm that sells fresh vegetables and meat on the right. This is by the village pond where, until about ten years ago, a pair of swans returned annually and nested, rearing many young much to the delight of young and old alike. 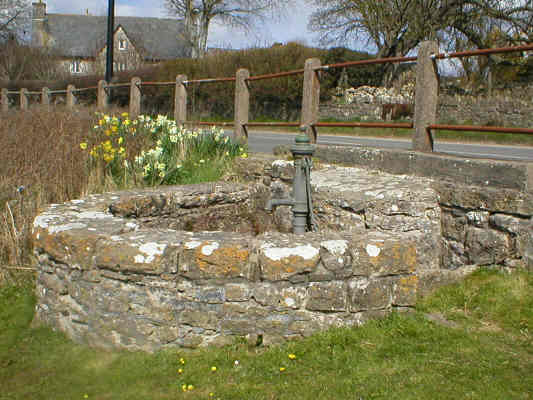 In 1993 the site of one of the original wells was cleared and a pump restored Whilst occasionally pairs have been seen on the water none have yet set up home, although there are many ducks and sometimes geese from the farm. On the left is The Farmers Arms that serves morning coffee as well as tasty fayre and excellent beer! Just before you leave the village, Pitcot Farm, famed for its pork, is on the right and Penuchardre Farm that rears cattle and also provides comfortable and affordable bed & breakfast accommodation for anyone wanting to stay for a few days, is on the left. Castle-upon-Alun is a small hamlet to the east of St. Brides Major. 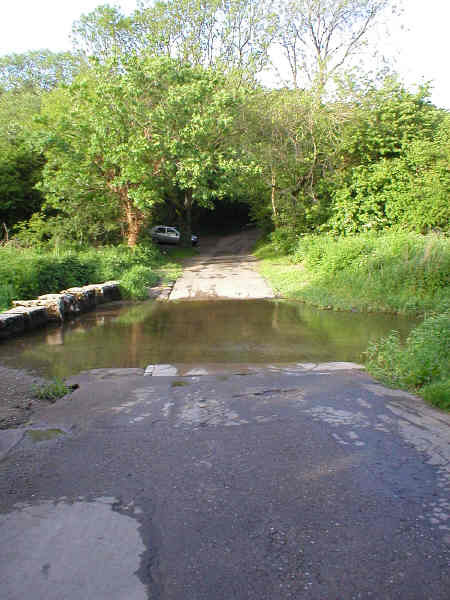 It can be reached by taking the road opposite the pond (by the Farmers Arms) then turn right at the crossroads, travelling slightly uphill, and the left fork at the next junction. Alternatively, when travelling from Bridgend take the second turning left after the cattle grid and immediately left again to go along Blackhall Road. Go straight across the crossroads (shown below) and take the next left fork. 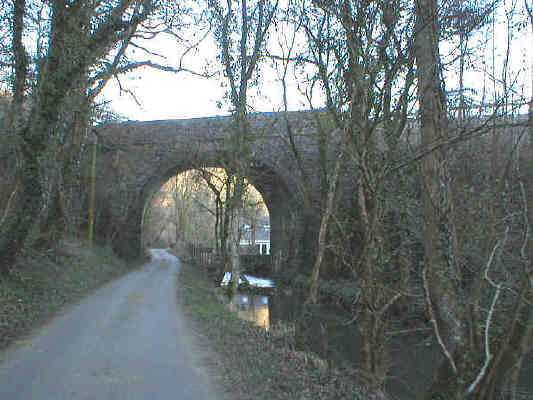 However, by going down the hill at the crossroads (left in the photograph above - it should be noted that this is a very narrow single-track road that widens in parts) you will come to Daffodil Wood (Coed-y-Bwl) on the left and pass an old slab footbridge known as Packhorse Bridge (which is now classed as an ancient monument) on the right. 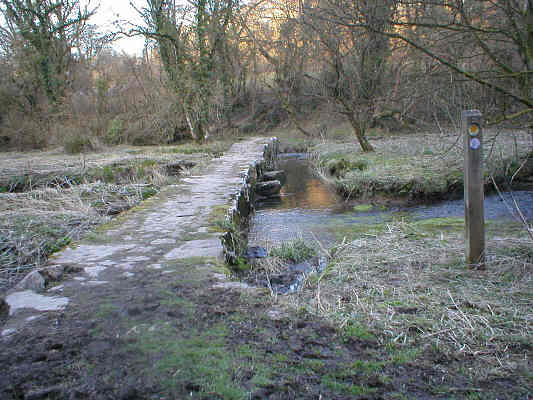 This was also called Clapper Bridge owing to the sound of the horses and donkeys hooves on the stone. Carrying on further, you will come to the ford at Pont-y-Brown. The River Alun dries up in summer but in winter can be too deep to cross. The stepping stones here are known as Stepsau Ddion and many small children have stood on them to fish for minnows and sticklebacks. Railway enthusiasts come to marvel at the brick-built arches in the area carrying the line between Bridgend and Barry - a marvellous feat of engineering. If you cross the stream (providing the water is shallow enough!) then turn right at the t-junction you will come to the site of Southerndown Road Station (closed on 23rd October, 1961 and now private premises). 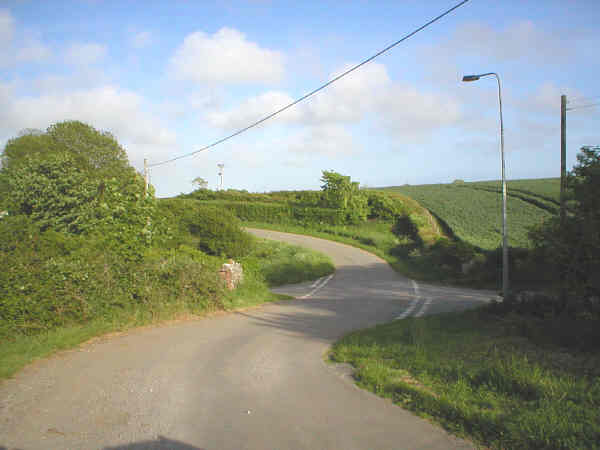 Turning right at the junction by Groes Gwta farm (and, after passing through the cluster of houses, taking the right fork at the y-junction) will bring you back to the original crossroads. Turn left to return to the pond or go straight ahead to travel to St. Brides Major via Blackhall Road. Castle-upon-Alun Farm was once a thatched farmhouse and it may have been the Home Farm of an old castle. Several stone arches and relics of an old building survive and it is thought that a Welsh castle of pre Norman times could have stood in the vicinity. Graves of the first century Roman-Celtic period containing spears and daggers have been unearthed in the area. Contributions to St. Brides Major, Southerndown and Ogmore-by-Sea web site are welcomed and may be sent via our Contact Us link or handed in to a member of staff in the Village Shop/Post Office in St. Brides Major, who have kindly agreed to pass them on. Web site design and content including text, graphics, articles and photographs subject to copyright. © Please remember mistakes can happen and there may be errors of which we are unaware; corrections, information and additional facts are gratefully received. The editors and owners of this web site reserve the right to remove, alter, or refuse to include, any link or contribution on this site, as they see fit. Furthermore, they accept no responsibility in any way whatsoever for the content, accuracy or reliability of any other web sites mentioned or linked within these pages. It is good practice to run anti-virus programme/s as well as to check sites, pages, and before downloading material; we cannot be held responsible for any losses or disruption to your computer, software, systems or data.